My learning to be an adult journey started when I turned 41. Before that I was a butterfly guided by angels and my divine parents , without having do bother very much myself. At 41 , it was as if these angel parents stepped out of the way and let me make my own 'mistakes' and take the consequences for them. They didn't abandon me , but it felt like an 'advanced course'. Come to think of it though, this learning to be an adult started at around 14 and then again at 25 , each time with challenges that were appropriate . Today I am thinking of 2 young girls 10 1/2 and 12 , both approaching puberty. Their father is in hospital recovering from surgery for a broken leg as a result of a work related accident. He's looking at a long period of convalescence and being self employed many hassles with insurance companies ; you pay them but they are often reluctant to pay out . The girls mother has been hospitalised now for many years now. It struck me , that these things always happen for a reason . How is this incident going to affect the girls and their father ? The two girls are going to have to start on an 'advanced course' and their father two might have to re-organise his life. 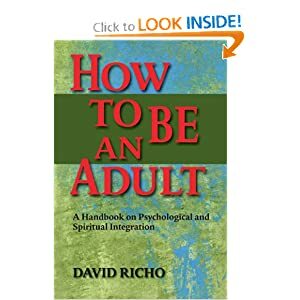 I am learning to be an adult again too , reading " HOW TO BE AN ADULT IN RELATIONSHIPS " by David Richo. Timely for me too , having recently become a grandmother . Adult love is based on a mutual dedication to granting attention , acceptance , appreciation, affection and allowing . These are the doorways to the joys and wealth of relationship, but too often we don't grasp what these words really mean and don't know how to fully manage them in our relationships. How to be an adult in relationships. The five keys to mindful loving.